In summary there is permission sought for the development of blocks of 2-8 storey buildings, comprising office space, retail units, a brewery, an almost 8,000 sq meter hotel, 92 residential apartments, a small indoor market/retail space and a small single story artist studio. See web pages to all the info, plans and elevations here. For the Dublin Flea Market this means the loss of a hall type market space to trade out of in Newmarket. We cannot survive with outdoor trade only. 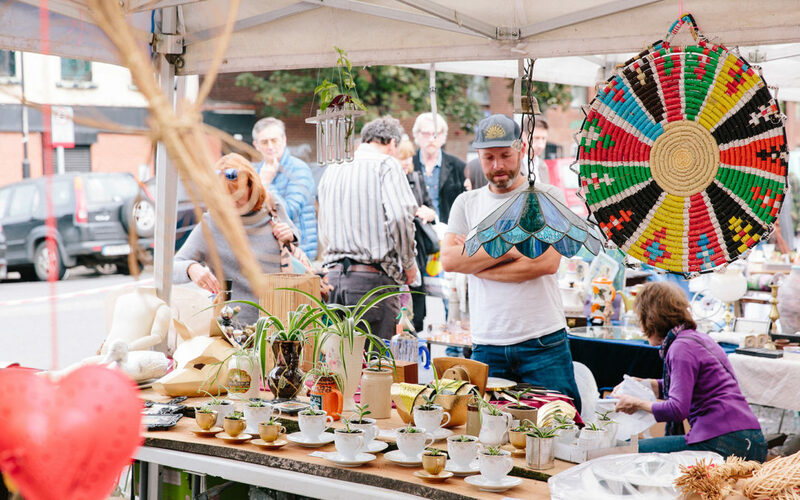 There are 5 other markets that anchor into the Dublin Food Co-op and Green Door Market on Sundays and it would mean the loss of these markets as well. We are not anti-development but we believe it would be a absolute travesty for the city to lose this buzzing market and creative hub that has evolved and prospered in Newmarket over the last ten to fifteen years. We have been advised that the best way to make sure our voices are heard is to enter into the planning process by making a written submission or observation on the application to DCC. The more people that submit individual letters voicing their concerns the more weight the argument will have. As we said, we are not anti-development but we feel that by making our voice heard as a community and working together with DCC and the developers, we can make Newmarket into a leading example in both Irish and European urban redevelopment with strong community and cultural elements at its heart. We only have until the 8th of August to submit observations – thats next Tuesday! It costs €20 and they will accept a cheque or bank draft. DEADLINE 8TH AUGUST 2017!!! The importance of the legacy of Newmarket as a market and creative hub. The guaranteed footfall that the markets brings to Newmarket, which could hugely benefit the proposed retail spaces. The importance of the Dublin Food Co-op and Green Door markets in the wider community and as an anchor tenant in the Square for the 5 Sunday markets. All 7 markets operating in Newmarket are tried and tested, well managed, well attended and well loved. That the small multiples we comprise of can feed into economic growth sometimes better than large single developments. LETS MAKE DUBLIN A CITY WE WANT TO LIVE IN!! !